The remarkable fact is that nobody can beat the market forever — not even Warren Buffett. A quick glance at the most recent Berkshire Hathaway annual report (PDF) highlights an amazing data point: Warren Buffett has compounded at 19.7% a year from 1965 through 2013; the S&P 500 Total Return Index has compounded at 9.8% a year from 1965 through 2013. The immediate reaction to these figures is predictable: “Warren Buffett is an investing god, so we should buy Berkshire Hathaway and throw away the keys.” The gut reaction is that Buffett can continue to beat the market forever. Unfortunately, as this post highlights, this is an impossible feat. “Value Investing: The Use of Historical Financial Statement Information to Separate Winners from Losers“: 23% annual return from 1976 to 1996. “The Asset Growth Effect in Stock Returns“: 26% annual return from 1968 to 2006. “Analyzing Valuation Measures: A Performance Horse Race over the Past 40 Years“: 17.66% annual returns from 1971 to 2010. But Markets Are Efficient . . . Right? Your conclusion must be false. Passive value managers hold value-weight portfolios of value stocks. Thus, if some active value managers win, it has to be at the expense of other active value managers. Active value management has to be a zero-sum game (before costs). To my chagrin, Fama’s comments were technically correct. I did not show that “value investors outperform the market” — far from it. I showed that a “select group of investors participating in Value Investors Club outperformed the market.” My evidence did not support the notion that value investors as a group outperform the market. I was broken from a fresh whipping by a market efficiency expert, but I learned a great lesson in arithmetic: Value-weight market returns have to be representative of the collective investor experience because the value-weight market return represents the return to all investors in the stock market. And for every active winner who outperforms the market, there necessarily must be a loser somewhere along the line. How Long Can We Beat the Market? To identify just how long a skilled investor can beat the market, I perform a study on the time series of value-weighted return (including all distributions) for the entire CRSP universe from 1926 through 2013 (representing all stocks traded on the NYSE, AMEX, and NASDAQ). If you are unfamiliar with CRSP, think of the database as the closest thing researchers have to the “total US market.” The Wilshire 5000 Index is the best “practitioner” analogy. Start a guaranteed “winner” portfolio on 1 January 1926 and invest at an above-market rate through 31 December 2013. This portfolio represents the experience of a highly skilled investor. Start a “loser” portfolio that represents the ownership of the rest of the market, approximately $28 billion. The loser portfolio returns the overall value-weighted market return minus the return it “lost” to the “winner” portfolio. This portfolio represents the experience of a passive investor who simply holds the market. An example highlights how my experiment works. The winner portfolio starts off owning 0.00001% of the entire market as of January 1926 and grows consistently at a market-beating rate of return. This initial ownership percentage amounts to a very modest sum of $2,804 billion because that is the market cap of all securities as of January 1926; the loser portfolio starts off owning the remaining 99.99999%. Consider the January 1926 CRSP value-weight market return (with distributions included), which was 0.7405%. This 0.7405% gain grows the total market value of all securities from $2,804 billion to $2,824 billion. 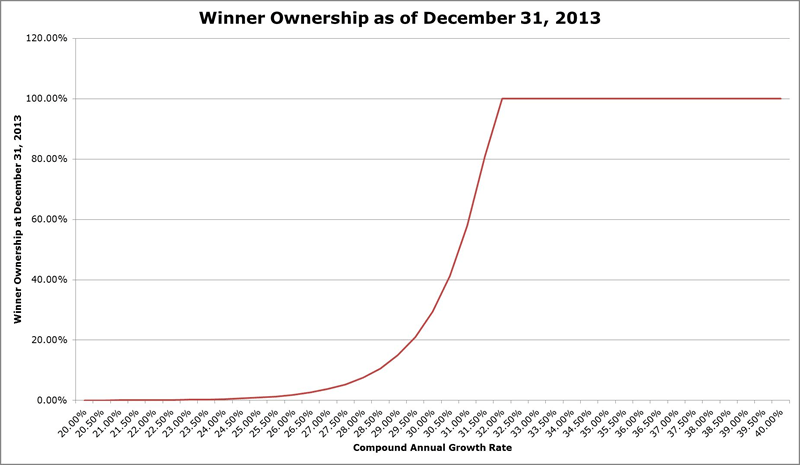 The “winner” portfolio — assuming a 30% compound annual growth rate — was 2.5% (30%/12). The winner portfolio grows from $2,804 billion to $2,866 billion. The “loser” portfolio, which represents the return remaining after the winner portfolio takes its outsized returns out of the market, decreases to $2,824 billion. In the end, the winner portfolio earns 2.50%, the loser portfolio earns 0.7404999%, and the entire market return earns 0.7405% (by construction, the value-weighted returns of the “winner” and the “loser” portfolios must equal the actual value-weighted market return). When does the “winner” portfolio own over half of the stock market? What percentage of the stock market does the “winner” portfolio own at the end of 2013? The following graph examines ownership percentage for various annual compounding rate assumptions and highlights why amazing compound annual growth rates must mean revert over time. With high levels of compounding, an investor quickly becomes the entire stock market. For example, at a 30% compound annual return, an investor owns 29.48% of the entire stock market at the end of 2013 — approximately $7.5 trillion of the $25.6 trillion in total market wealth as of 31 December 2013. At even higher rates of compounding, say 32% and higher, an investor would eventually own the entire stock market. This result is impossible on many levels. The harsh mathematical reality is that all great investors eventually manage a portfolio with massive scale. Earning a high return eventually forces a skilled investor to own a larger and larger percentage of the stock market. Earning 25% — or more — compound annual returns over long horizons is virtually impossible. Investors earning 32% or higher returns end up owning the entire stock market. A “doable” 20% a year implies that an investor will own 0.026% of the market at the end of 2013. With a $25.6 trillion total market value as of 31 December 2013, this implies a personal stock portfolio worth $6.6 billion — not a bad retirement plan. Warren Buffett — and perhaps a select handful of others — has been able to achieve 20%+ returns over very long time periods. These individuals represent some of the richest people on the planet because of the phenomenon described in this experiment. Great investors might have an epic run of 20%+ returns for five, 10, maybe even 15 or 20 years, but as an investor’s capital base grows exponentially, the capital base slowly becomes the market, and the market cannot outperform itself. If you liked this post, don’t forget to subscribe to Enterprising Investor. I read your post with great interest, partly because I am working on a strategy that is designed to deliver consistent long term performance. One question I have – what if the market itself expands so much so as to easily absorb the portfolios that have the compounded rates of return you so elegantly describe? I am thinking about boomers. Let’s assume that 40% of a boomers net worth was in the home they lived in. Assuming that the birds have left the nest, the boomers downsize or die, and you have this 40% now either sitting on the sidelines or entering the market. Appreciate any insight you might have into this. To compare Buffett’s results to the S&P 500 is a bad start. Like many active managers he likes to use an inaccurate benchmark so his results can look better and he can tweak his comparisons when it benefits him. How much of Buffett’s portfolio truly fits into the S&P 500 and how much drift away from the index does he incorporate? If you create an accurate composite to measure Berk-Hath to, how does he do then? And on a fully risk adjusted basis how does he do? Without that data I’m not sure that any worthwhile assessment of the Oracle is remotely possible. The thought exercise assumes reinvestment of the excess active gains. What happens if the markert gain is reinvested but the excess active gains are taken as cash and spent on yachts, Ferraris and private islands in the Bahamas? This scenario appears a more realistic representation of human nature and means that the investor can theoretically outperform the market for ever without ending up owning it. Fama is wrong, again. Many value stocks are held by concentrated owners and not by third-party external managers. Economists always make the tricky arguments that try to say “it doesn’t matter” look at the thing as a whole. Many of the best assets don’t show up in the float of indexes.